"Come after Me, and I will make you become fishers of men." The main symbol of the early Christianity was the Fish or Ichthys, which means "fish" in Greek. 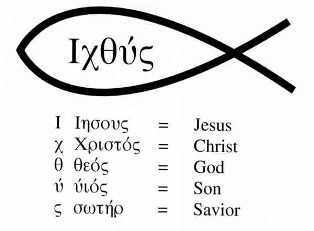 It is also an acronym for the phrase “Jesus Christ, Son of God, Savior”. Master Jesus was the Fisher of Souls and he also found the majority of his disciples among the fisherman of the Galilean sea. The first literary allusion to the fish as a Christian symbol is from Clement of Alexandria (born c. 150) in Paedogogus, III, xi. 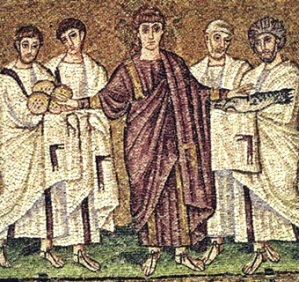 The symbol itself may have come from the extraordinary story of the loaves and fishes (John 6:1-13) or even from the meal of fish Jesus shared with His disciples at the Sea of Galilee after the Resurrection (John 21:1-13). The Fish has also been the pictorial image of an entire era: the Age of Pisces. The zodiacal sign of Pisces reigns over the physical feet of the human body. The Fish as a mystic icon represents the original letter Nun of the ancient Hebraic language and in Aramaic literally means Fish; but it is also interpreted as a synonym of kingdom, heir to the throne and "unbounded servant." The sacredly symbol also appears in other religions and mythologies, and is more ancient then early Christianity. The first Avatar is known in India to be Lord Vishnu and his first manifestation was in the form of a fish. Vishnu is also described in the Bhagavad Gita as having a “Universal Form”, or Vishvarupa, which is beyond the ordinary limits of human perception or imagination. He who has no understanding, who is unmindful and always impure, never reaches that place, but enters into the round of births. But he who has understanding, who is mindful and always pure, reaches indeed that place, from whence he is not born again. But he who has understanding for his charioteer (intellect), and who holds the reins of the mind, he reaches the end of his journey, and that is the highest place of Vishnu. Oannes is the Greek rendered name of the Sumer-Babylonian god Ea, and because of his connection with waters is sometimes depicted as half man, half fish. In daytime he lived with men to instruct them in the arts and sciences, but at night he returned to the depths of the Persian Gulf. The fish headdress of the priests of Ea the Sumer-Semitic God later became the miter of the Christian bishops. "At first they led a somewhat wretched existence and lived without rule after the manner of beasts. But, in the first year appeared an animal endowed with human reason, named Oannes, who rose from out of the Erythian Sea, at the point where it borders Babylonia. He had the whole body of a fish, but above his fish's head he had another head which was that of a man, and human feet emerged from beneath his fish's tail. He had a human voice, and an image of him is preserved unto this day. 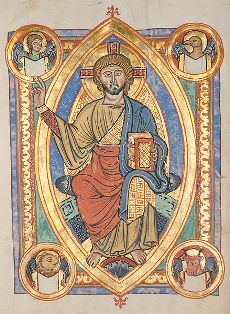 He passed the day in the midst of men without taking food; he taught them the use of letters, sciences and arts of all kinds. He taught them to construct cities, to found temples, to compile laws, and explained to them the principles of geometrical knowledge. He made them distinguish the seeds of the earth, and showed them how to collect the fruits; in short he instructed them in everything which could tend to soften human manners and humanize their laws. From that time nothing material has been added by way of improvement to his instructions. And when the sun set, this being Oannes, retired again into the sea, for he was amphibious. After this there appeared other animals like Oannes." ~Berossus, Babylonian priest of the 13th century B.C. In China, the Great Mother Kwan-Yin, the goddess of Compassion, is often portrayed with the silhouette of a fish. Atargatis is a Goddess of Syrian origin whose worship spread to Greece and Rome. She was regarded as a Great Mother and Fertility Goddess of the Earth and Water; and she is so closely identified with the fish that sometimes she was represented in the form of a mermaid. In India, the Goddess Kali was called the "fish-eyed one". Hatmehyt was a fish-goddess worshipped in the Delta of the Nile. Her name meant "she who is in front of the fishes" referring to her preeminence in relation to the few rival fish cults. It can also be interpreted, however, in a temporal sense to stress the goddess as the "beginning", or the earliest fish-goddess to exist when Egypt emerged from the primeval waters. She can be represented completely as a fish as well as a dolphin. Also in Egypt, Isis was called the Great Fish of the Abyss. The waters of the abyss are a metaphor for the primeval waters of the creation cited in Genesis 1:6. The original waters of creation carry within it the selfless incipient seed of consciousness: an intelligence that is not self-aware in this state. The fish, therefore, represents a soul that lacks self-consciousness in the pursuit of liberation though the sacrificial experiences in the sea of manifestation. "Then I saw a new heaven and a new earth; for the first heaven and the first earth passed away, and there is no longer sea." For those familiar with esoteric astrology, there is a great deal of relationship between the symbols of the fish and the loaf of bread. This thematic pair is epitomized in many significant passages of the New Testament including the unforgettable account of the multiplication of the fish and loaves of bread. "And they said to Him, 'We have here only five loaves and two fish. These elements represent simultaneously the sign of Virgo (the wheat of the bread) and Pisces (the fish) and hold an opposition in their locations in the night sky: both constellations are situated at parallel points at 180 degrees from each other. They are the symbols of sacramental fish, with wine and a basket of bread; which represents the Eucharist and the Last Supper in Christian art. "What father among you, if his son asks for bread, would give him a stone, or if he asks for a fish, would give him a snake instead of the fish? The astrological axis represents the “service to others” theme through Virgo, and the “compassion for the suffering of others” through Pisces. They are also powerful personifications of the archetypes of the Healer (Virgo) and the Mystic (Pisces). The Pythagorean philosophers regarded the number 153 as a sacred number due to its use in a mathematical ratio called "the measure of the fish," which produces the mystical symbol of the vesica pisces: the intersection of two circles with the same radius, intersecting in such a way that the center of each circle lies on the circumference of the other. The name literally means the "bladder of a fish" in Latin. One of the numbers in these ratios 153 also appears in the Gospel of John (21:11) as the number of fish Jesus caused to be caught in a miraculous catch of fish, and significance has sometimes been attached to this. The vesica pisces is an ancient symbol representing the uterus and fertility. 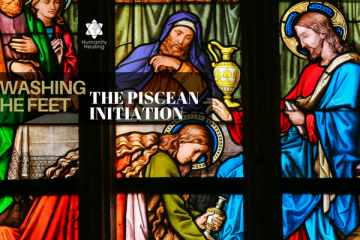 Other representative stages of rites of the Piscean Initiation are mentioned in other episodes of the Holy Bible, as well as in the Quran. For instance, the mythological story of the Prophet Jonah who survived three days and three nights inside of a giant fish’s belly, prepared especially by God. 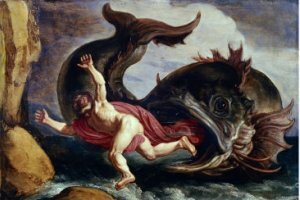 Jonah is also called Dhul-Nun in Arabic; meaning The One of the Whale. In Jewish tradition, Jonah was the boy brought back to life by Elijah, the prophet. “Jonah was three days and three nights in the belly of the great fish, so will the Son of Man be three days and three nights in the heart of the earth." 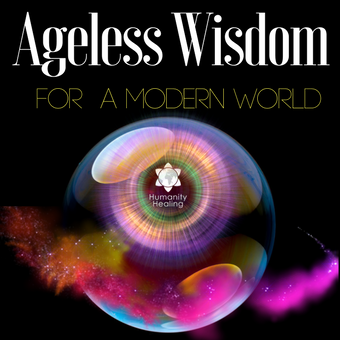 Going back to the womb, or to be immersed again in the primeval waters of creation, are the descriptions of one of the many the initiating rites of ancient world. This is specifically the case with Egypt; where the seekers would submit themselves to a journey through the underworld, almost like a shamanic journey of sorts, introducing them to the internal planes, the archetypical world of pure consciousness. This initiation/journey required three days to complete. It was a treacherous journey and many candidates perished during the ceremony. 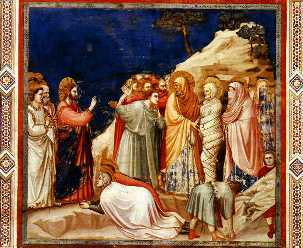 Many authors of Ageless Wisdom and experts of ancient traditions regard the death and resurrection of Lazarus as one of an initiation experience gone wrong, and as such, the situation could only be remedied by a Kabir or master such as Christ Jesus. 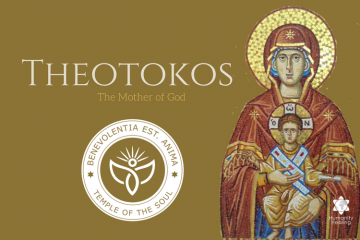 The Greek word "delphos" meant both fish and womb. The word is derived from the location of the ancient Oracle at Delphi who worshipped the original fish goddess, guardian of the waters, Thetis.